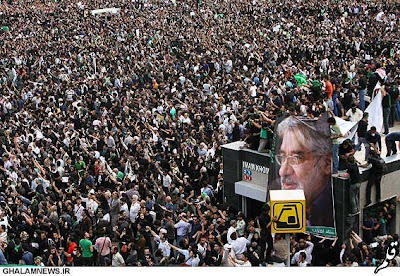 It's 3 pm in Iran now and there seems to be some disinformation out there on Twitter that the rally is not going ahead, but this is not true - most are saying that the march is going ahead with Mousavi, Khatami and Rafsanjani at Enghelab Square. I think Karroubi too. People on Twitter in English are saying that the streets are full of riot police but haven't seen a source for that yet. Some on Twitter that are saying that the rally has been called off might be using this as the source, but doubtful that will have any effect. The Guardian Council also says they'll conduct a 10% recount of the ballots "even though they don't have to". Since the opposition wasn't even happy with a full recount this will go nowhere towards appeasing them. A few tweets in Persian now specifically saying that the rally has not been called off and to not pay attention to rumours that it has been cancelled. Twitter traffic in Persian for the word Enghelab (انقلاب) is now beginning to pick up quite a bit. The rally has just begun and Twitter is saying that there are a lot of police but they're not doing anything, and there is a huge number of people. Some tweets in Persian are saying that there are special forces on motorcycles I think. which says "Karroubi: Today I will be going to Enghelab Square!" Some pictures of riot police apparently from today can be seen here. A lot of people are saying that riot police are keeping thousands of people from entering the square. It's already 5:30 pm in Iran and still no photographs of the rallies. Many are reporting that there are clashes between protesters and riot police trying to keep them from entering the main squares, but no idea so far as to the number of people today. Still waiting..
Fark.com has a green band on its logo today. Unrelated fact: fark means difference in Turkish. 5:45 pm: BBC Persian is talking about iPhones. There is a report here of a blast at Khomeini's shrine. Right away people are saying that this was planned by the government to make protesters look bad. Oh, here's an image of people that looks to be from today. 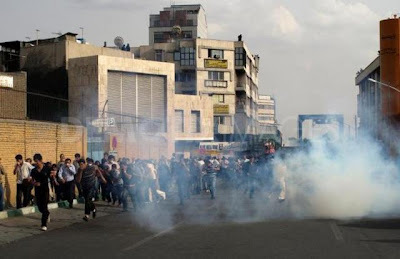 Most reports are now saying that the security operation around Enghelab Square is simply too huge for protesters to get by, that there are a lot of fights / beatings going on, and that a lot of people are taking refuge in Tehran University which has over a thousand people there now. Many are saying that police have closed off Tehran University as well but I haven't seen the source for that yet. A video just went up of regular people driving back Basij. You can hear chants of death to Khamenei and death to the dictator. Love the bit at the end of the video here. 8:20 pm in Iran: if you're reading the liveblogging by Andrew Sullivan or Nico Pitney you'll see that the situation is extremely chaotic, with reports of deaths at the hands of police, some weird chemical agent being fired from the air, and Mousavi has given a speech where he said he is ready to die for the cause. The atmosphere is once again like the first two nights after the election. Now it looks like this. Another death to the dictator video. More pictures here. A Bank Mellat (state-owned) can be seen in the first one - one of its branches was set on fire the day after the election. A lot of tweets in Persian now (9:00 pm in Iran) are saying that Mousavi has asked people to strike if he is arrested / captured. 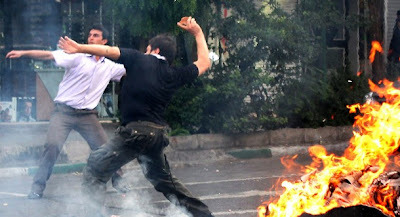 Chasing away the Basij in one area. It's past 3 am here in Korea and 10:30 pm in Iran. Apparently the Allaho Akbar chants tonight are louder than ever before. Not enough time left in the day and far too much is happening now to get an accurate grasp of. Today has turned out to be everything we feared it would be. At the same time though there is no sign that this uprising will subside, and many are saying that this is the beginning of the end of the government in Iran as it is now, now that it has shown its true face to the world with no way to pretend otherwise. Some of the videos being posted online now are extremely graphic, and one of them even shows a young woman after being shot in the chest before she dies. And what do they have on their side? A fake bombing in Khomeini's shrine. We're being told that state TV couldn't even make it look like a real explosion had occurred, with a single broken window as evidence that a bomb had gone off. Here's hoping for better news tomorrow. One more edit before bed: three new videos have just been posted. This video has been removed by the user (or perhaps by the government spoofing to be the user -- one never knows nowadays). If you saved a copy of it, could you re-upload it to Youtube? Note that chanting "death to.." or "marg bar.." doesn't mean quite the same in farsi as in the west. It is more like "damn to..". Damn traffic! This is because the religious authority needed to damn something. Death to the regime is therefore more like "down with the regime". They* don't want to murder the whole regime. *not everyone wants to, that is.